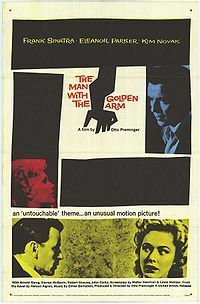 The Man with the Golden Arm is a 1955 drama film, based on the novel of the same name by Nelson Algren, which tells the story of a morphine addict who gets clean while in prison, but struggles to stay that way in the outside world. It stars Frank Sinatra, Eleanor Parker, Kim Novak, Arnold Stang and Darren McGavin. It was adapted for the screen by Walter Newman, Lewis Meltzer and Ben Hecht (uncredited), and directed by Otto Preminger.